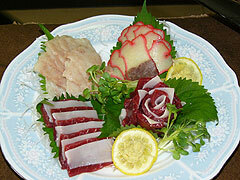 Following some insistent queries, I felt it was about time to publish my thoughts again about whalemeat! 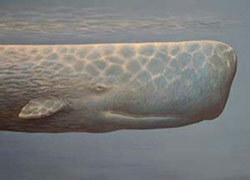 Most of it comes from Mink and Sperm Whales/Mako Kujira. 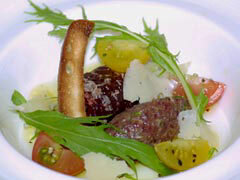 “Kujira Salad”, including Whale Tartare and Carpaccio. I would like to to remind short memories that whales were practically decimated from (under) the surface of this world in the 19th Century by US and European whalers (including French Basques as I had to remind my own brother!) for their oil used in lamps. Once the fat was collected the remains were dumped back into the sea. When the US in particular realised that they were quickly running out, they pushed for mineral oil exploitation with the economical and political consequences we are still suffering from. In short the overkilling of whales is the direct cause and link to wars in the Middle East. A whaler! The US had had promoted a common whaler captain to the grand rank of Commodore for the political and diplomatic needs of the time as he happened to ply his trade in nearby seas (I mean in the vicinity of Japan)! 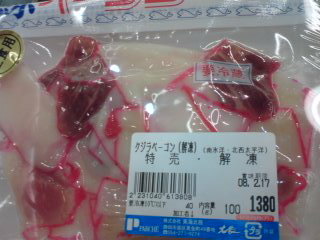 I once was accused of trying to get attention, being told in the process that whalemeat was not sold in my Prefecture. 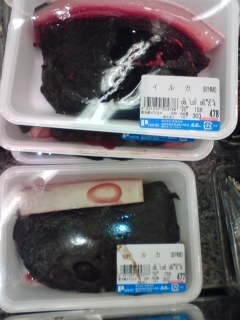 Here is what is on sale at Parche, the largest Supermarket in Shizuoka City. Whale bacon is available all year. Reading the label, it said the whales wre caught in Northwestern Pacific. Bacon is very popular here and can be eaten at izakaya. 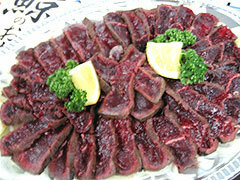 Plenty of dolphin meat is avalaible. 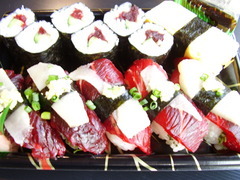 This particularly came from Gunma Prefecture. Last question: What do the Inuit think of the US and Canada limiting or depriving them of their livelihood? I live near Osaka and had some at an izakaya once. Tasted rather like beef. Personally, if it’s not an endangered species (Minke and Sperm aren’t), I have no problem with eating it. Whale fishing was prohibited long ago. 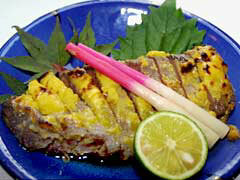 Japan says it fishes some for research, which is obviously untrue. I won’t judge the act of fishing and eating whale itself, but the lie they tell when they say fishing thousands of whales every year is for scientific investigation, when the fact is that they go to supermarkets. By the way, it is very common for the Brazilian marine to have to expel japanese whale boats from brazilian waters because they not only violate the frontiers but as well fish forbidden species there. I saw some of those myself.